The former capital Yangon, also known as Rangoon, remains Myanmar largest city and continues to be the country’s most important commercial hub and gateway for most of its international visitors. Its colonial background and religious legacy make it one of the most mesmerizing and genuine places in all of Southeast Asia. Upon arrival at the airport, you will be warmly welcomed and accompanied to your hotel for check in (check in possible from 2 pm. Subject to availability). Visit Kyaukhtatgyi Pagoda, which is home to a 72 meter long reclining Buddha statue that features detailed carvings on his feet. Afterwards, you continue through town in order to make a quick stop by the Royal Lake located in Kandawgyi Park which is very popular with local residents, especially in the early morning and around sunset. Catch a view of Karaweik Hall, a reproduction of a royal barge and enjoy a spectacular view of the Golden Shwedagon Pagoda. No Myanmar expedition can be considered truly great if it’s lacking a visit to the legendary Shwedagon Pagoda. Ready for an amazing experience? The visual delights present there alone, are worth the trip. Witness the colors transform on the 100-meter chedi which is literally enclosed in over 40 tons of gold leaf. You will start at the eastern staircase where you will find a row of shops at the base of the temple selling various religious items. Here you will find monks robes, alms bowls, offerings, incense and other unique Buddhist objects. As you browse the stalls your guide will explain the use and rituals of Myanmar’s Buddhist people. Shwedagon is largely considered to be the most important religious site for the Burmese; most visitors report that the trip is extremely memorable and still etched into their minds. After sunset head on to Mahabandoola for a change of scenery. Following breakfast, you will be transferred to the airport for your flight to Bagan (flight not included, to be booked by agent). Welcome to Bagan, known as one of the greatest architectural sites in Asia. The majestic Bagan, about the size of Manhattan, with its more than 4,000 temples made of red bricks, is one of the highlights for each Myanmar travel and a visual treat for any holidaymaker. Upon arrival, you will be transferred to your hotel for check-in (official check-in time is 2 pm). Your first port of call is an elevated location amid the temple plains to see the fields and pagodas of Bagan. From here you will have a look at the Ananda Temple – one of the most exalted of Bagan’s temples. We will ensure that our tour reaches this point before the majority of tourist arrive, enabling you to enjoy the splendor of the temple in relative tranquility. Continue to various other temples dotted around the temple plains to experience a variety of architectural styles in the area as well as the artistic wonder of the 9-14th centuries. Traveling amid the temples you will get a taste of rural Bagan life in this ‘living museum’ setting where farmers and families work amongst the monuments. You will be driven late in the afternoon to the jetty where a private wooden river boat awaits you. Sitting either under the shade or on the open-deck you’ll be treated to fabulous views as you cruise down the Irrawaddy River. You’ll cruise past several small villages, fishermen, local boats and of course many of the ubiquitous Myanmar Buddhist temples. The views of Bagan from the river are particularly spectacular and offer a different perspective from the land-based tours. As you finish your delicious and refreshing cocktail and the sun begins to sink slowly from view, you will prepare to disembark before being driven back, greatly relaxed, to your hotel for the evening. Today, there is an optional excursion: Hot Air Balloon Ride Over Bagan. The morning will start off with an exciting hot-air balloon ride above the Bagan countryside. You will observe one-of-a-kind views when the sun begins to rise over the Irrawaddy River and various stupas in the region. You’re simply not going to find many other opportunities like this on Earth. (Only available from October/November through March) After breakfast at your hotel, your guide and driver will pick you up to start your Bagan excursion. It’s off to the vibrant Nyaung Oo Market, where the locals come to trade fresh produce and other goods daily. From here you will start with a visit to the renowned Shwezigon Pagoda, constructed by King Anawrahta in the early 11th century as a religious memorial. Travel over dusty lanes and tree-shaded roads past temples and monasteries to a small village. Explore the village on foot, getting a glimpse of local lifestyles of Bagan’s residents. Continue to more lesser-known monuments, selected based on your interest, in the area for the remainder of the morning. Along the way, you will pass several villages that are built on stilts over the lake, which are inhabited by the local Intha people. Observe the daily activities of the local leg-rowing fishermen and see their ‘floating gardens’, which are built up from strips of water hyacinth, earth and anchored to the bottom of the lake with bamboo poles. You will also visit Nga Hpe Chaung Monastery, which houses loads of early Shan Buddha Images. In the past this temple was known for its ‘jumping cats’ but these days there are only a few felines roaming around and none are jumping anymore. Yet the Buddha images are still worth the visit. Proceed to the Phaung Daw Oo Pagoda, the lake’s main haven, which contains five sacred images of Buddha decorated in gold leaf. There are also many traditional crafts originating on Inle Lake and, should you wish, we can stop for a visit to one making incredible woven items from lotus silk, boat builders (depending on the time of year), a cigar making workshop, blacksmiths or even silversmiths. From Nyaung Shwe you’ll be transferred Heho Airport for your domestic flight to Mandalay (flight not included, to be booked by agent). You will depart from Mandalay first thing for a picturesque two-hour drive (76 km) to the past British hill post of Pyin Oo Lwin (Maymyo), which is positioned on a plateau resting at around 1,000m above sea level. Various remnants of the colonial period are still in attendance in Pyin Oo Lwin. In 1896 The British colonial establishment decided to turn the locale into a hill post, christening it “Maymyo” after Colonel James May who was a well-known soldier stationed there. The railway system traveling from Mandalay turned Maymyo into a nice summer spot. The Pyin Oo Lwin of today is a sanctuary for numerous tribal groups in addition to some Nepalese or Hindus that immigrated throughout the British occupation. Take pleasure in a traditional horse and carriage outing around town. Admire the brick and timber houses, complete with English style gables, turrets, and chimneys and feel like you are taken back in time. You should also go to the local market to gaze at the various flowers and vegetables they have there. Check out the Botanical Gardens sporting around 432 acres of space and habitat to a varied blend of plant species from around the globe. The Gardens were launched by Sir Harcourt Butler, a previous superintendent of Burma. Following breakfast, transfer to the train station for an enchanting 4-hour train journey on the Mandalay-Lashio train passing by villages and railway bazaars that float by the carriage windows in a timeless fashion. The history of this particular train is tied to the black market trade with China. Along the way, you will encounter many rich and enticing photo opportunities. The train also traverses the renowned Gokteik Bridge, which was built in the 1900s by the well-known Pennsylvania Steel Company when Burma was part of India. Take notice of the impressive height of the bridge; around 300 meters from the track to the valley floor. The train should arrive around 12:00 in Naung Pen where you will disembark and transfer by car to Mandalay. Picnic lunch on the train. Walk up to Mandalay Hill, rising 240 meters above the city. At the top, the reward is a full panoramic view, the hazy blue outline of the Shan Hills to the east, the Mandalay Palace (and the city sprawl) to the south and the Irrawaddy River to the west. Directly south of Mandalay Hill stands the Kyauktawgyi Pagoda, known as the pagoda of the Great Marble Image. Admire the huge Buddha, carved from a single block of marble. It’s said that the colossal marble block took 10,000 men almost two weeks to transport it from the riverside to its current location. Proceed to Kuthodaw Pagoda, frequently dubbed as “The World’s Biggest Book” for its collection of 729 marble slabs inscribed with Buddhist teachings. Then it’s off to the Shwenandaw Monastery, the Golden Monastery which is the only enduring structure from the Royal Palace of the 19th century. This impressive structure is celebrated for its remarkable woodcarvings. Your Mandalay guided tour continues this afternoon with a visit to the Mahamuni Pagoda. This pagoda houses one of the country’s most honored Buddha images, completely covered in gold leaves that are every day applied to the statue by male devotees. There are also many craft workshops in Mandalay and, should you wish, we can stop for a visit to one making gold leaf, tapestries, wood carvings or marionettes if you are interested and if time allows. Next drive to Amarapura, Myanmar’s penultimate royal capital. Amarapura means “City of Immortality”, though its period as capital was relatively brief. You will start Mahagandayon monastery, home to more than a thousand young monks and renowned as a center for monastic study and strict religious discipline. Continue on foot or by bus a short distance to the legendary U Bein Bridge, which was built in 1782 when Amarapura was the Royal center of attention. It spans 1.2 km across the shallow Taungthaman Lake and is said to be the longest teakwood bridge worldwide. As a stunning day comes to an end head back to Mandalay for the night. Transfer to the airport of Mandalay for your flight to Yangon (flight not included, to be booked by agent). Upon arrival at Yangon airport, set off for a pleasant drive to Kyaikhtiyo (190 km, 5 hours), home to one of Myanmar’s most well-known landmarks. Renowned for its unstable location and religious significance, the ‘Golden Rock’ is a massive boulder covered entirely in gold leaf and precariously balanced right on the edge of a jagged cliff. On the way, you will pass the Allied War memorial park near Htauk Kyan, the final resting place for over 27,000 Allied soldiers where you can make a brief stop. Upon arrival in Kin Pun, a small town at the foot of the mountain, switch vehicles to a public local truck for a winding, exhilarating ride the top of the mountain. If you wish, you can get off at the half-way point (45-minute drive – truck stop “Yeataetaung”) and continue on foot all the way up. A challenging – yet rewarding – paths to the summit (4 km – around 45 min). Arriving at the Golden Rock you’ll be awe-struck by the gleaming Golden Rock and the views that surround it. The pagoda here is said to hold a hair of the Buddha and many Buddhists from all over Southeast Asia come here to worship. Watch as the sun sets overtop of Kyaikhtiyo – a magical sight- and then return to your hotel for the evening. In you wish to pay an early visit to the sacred place at sunrise, you’ll have the opportunity to visit the Golden Rock again to soak in its atmosphere, especially when the glinting boulder is bathed in the purple, sometimes misty light of dawn. Afterwards, you’ll drive or trek down to the base camp by the same route and return to Yangon. On the return, stop in Bago to stretch your legs and explore this former capital of the Mon kingdom. Browse through the colorful local market where vendors sell flowers, produce and spices. Your exploration of Bago will continue to the thousand-year-old Shwemawdaw Pagoda which features a spire taller than the one of Shwedagon Pagoda. And then carry on your sightseeing tour to the 55-meter long Shwe Tha Lyaung Buddha, which is recognized as one of the country’s most extraordinary images. You can also, should time allow, visit Hin Thar Kone Pagoda which has some interesting Nat figures and offers views over Bago from its upper platform. Once you’ve arrived back in Yangon (ca. 80 km – 1.5 hours), you’ll be dropped at your hotel. Note: The visit of Golden Rock in the early morning – at sunrise – is only available for clients staying at Mountain Top Hotel or Kyaiktho Hotel. Guests staying at Golden Rock Hotel will have to leave the hotel early and walk approximately 45 minutes up to Golden Rock if they wish to reach the top on time for sunrise as Golden Rock Hotel is not located at the top. Unfortunately, it is already time to say goodbye to one of the most impressive and enchanting countries in the world. Depending on your flight schedule, you can go on your own at Bogyoke Market, better known under the name of Scott Market to stroll through the stalls filled with handicrafts and do your last minute shopping (the market is closed on Monday and during the holidays). Transfer to Yangon International Airport, check-in for flight back. Located 1.9 miles from Manuha Temple, Amata Garden Resort Bagan in Bagan has rooms with air conditioning and free WiFi. 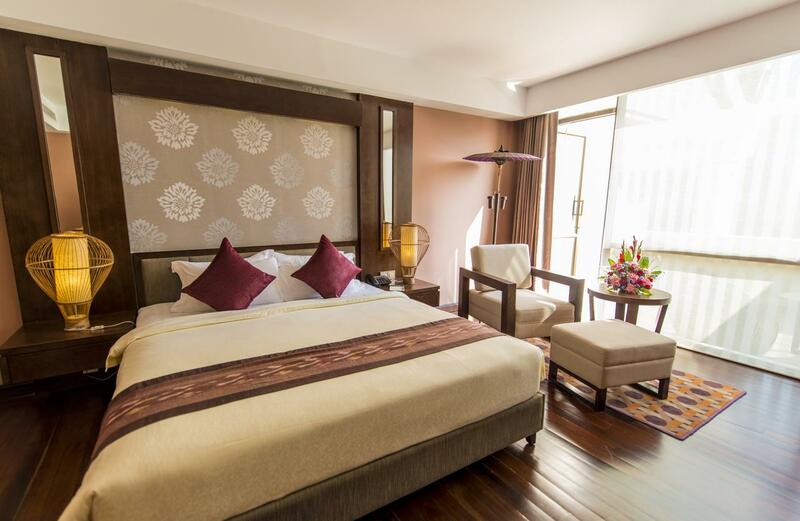 2.3 miles from Gubyaukgyi Temple, the hotel provides an outdoor swimming pool and a garden. Each room comes with a balcony with a garden view. At the hotel, each room is equipped with a desk and a TV. Each room includes a private bathroom. The rooms will provide guests with a fridge. A buffet breakfast is served daily at the property. Guests can grab a bite to eat in the in-house restaurant, which serves European cuisine. Amata Garden Resort Bagan has a terrace. Dhammayazika Pagoda is 2.3 miles from the accommodation. 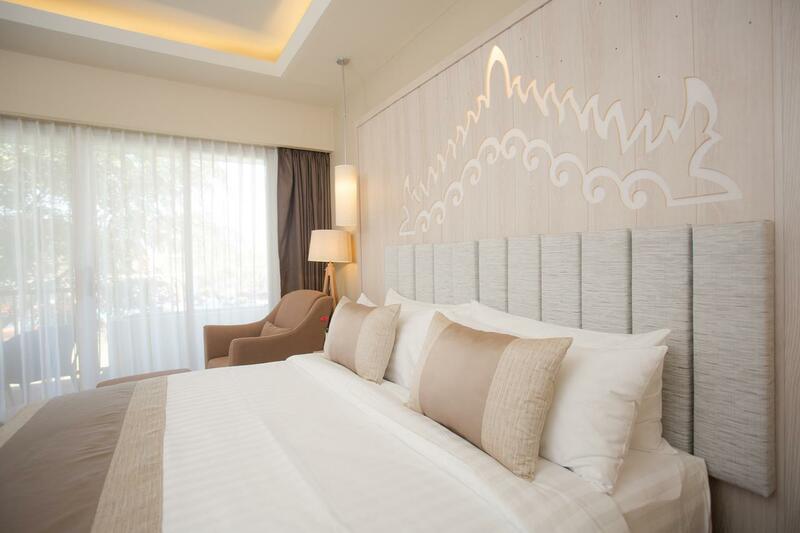 The nearest airport is Nyaung-u Airport, 6 miles from Amata Garden Resort Bagan.